Quite a tale about a man and his daughter who were racing a 19-foor Beach Cat in the annual St. Thomas YC Rolex Regatta this past Saturday and were the victims of an apparent hit and run on the water. Luckily they were unharmed, although their Cat was smashed and they were set adrift in open water. The story interests me on many levels – the first of which is that their rescuer was the day charter boat Happy Hour owned by a Captain Spencer. When I was in St. Thomas (1994-1996) the Happy Hour sailed out of the old Yacht Haven marina. I lived on a boat in that area of Charlotte Amalia harbor (Earth Base) and got to know Spencer pretty well. He runs a solid outfit, very popular and great fun – I’m not surprised he (or his crew) rescued the victims. The other area of interest is that the attacking boat appears to have been a day charter bound for, possibly, Buck Island. 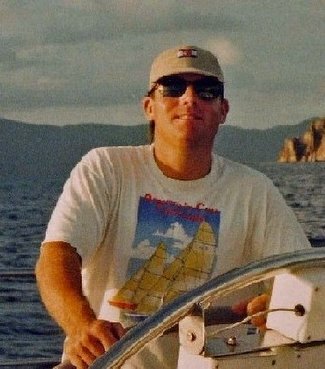 One of my first sailing jobs was crewing on these day charters – we’d pick up cruise ship passengers for a half day sail out to Buck Island, anchor and snorkel and sail back. It’s a tight knit community and I imagine that the hit and run captain’s name will surface and he’ll be summarily ostracized. There are few worse things in the sailing community then smashing a boat that has starboard tack right-of-way (and is smaller) - and then leaving her crew to swim for it in open water. It’s the sort of thing box stocks were invented for. I’ll bet they still have a set kicking around the island somewhere...I hope they dig them out for this guy and string him up in the public square.